$1,890,000 Kingsway South! Gorgeous Family Home! Welcome to 6 Cedarcrest Avenue, a Beautiful Re-Build in Toronto's Gorgeous Kingsway South Neighbourhood! Solid Quality Workmanship Through-Out, No Luxury Over-Looked! 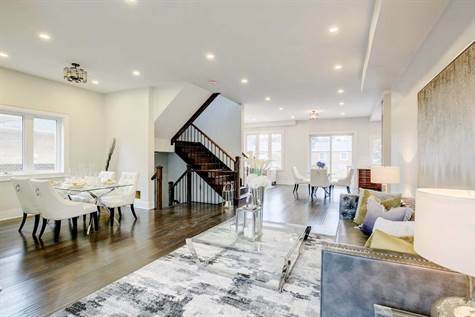 This Stunning Home Truly Shines with Hardwood Floors and Luxury Lighting Through-Out! The Main Floor Hosts a Bright Formal Living Room with Spectacular Fireplace, a Family Room and Luxurious Gourmet Kitchen with Gorgeous Custom Cabinetry! There are Four Beautiful Bedrooms on the 2nd Level. The Master Bedroom Retreat is Huge and Features Coffered Ceilings, Walk-In Closet and 4 Piece Spa-Like Ensuite Bathroom! The 2nd Bedroom Overlooks the Backyard and Features a Walk-In Closet and 3 Piece Ensuite Bathroom. The 3rd and 4th Bedrooms share a Semi-Ensuite Bathroom! You Can't Beat this Location if You Are Looking for a Great, Established Family Neighbourhood! Close to Grade A Schools, Shopping, Montgomery Swimming, Work-Out Facilities and More!